Kim Kardashian has given fans a rare tour of her bizarre all-white home, and it's fair to say that privacy wasn't at the forefront of the designer's mind. The cavernous pad - which cost a staggering £46million to build - doesn't feature a single interior door. Not on the bedroom, not on the bathroom. Nowhere. 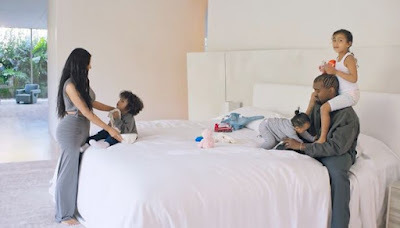 Kim, 38, opened up her Hidden Hills home for Vogue's 73 Questions, which shows Kanye sat on their all-white bed playing with their kids Chi, one, Saint, three, and North, five - who are eating. On the sheets! The over-sized bedroom leads to an ensuite roomy enough to house a whole rugby team. The entire exterior wall of the bathroom is made up of an endless glass window, which looks out over a Jurassic Park-style mini-jungle. The restaurant-sized kitchen is again large enough to feed an army, but anyone hoping to take a seat in the front room might be disappointed as there's just one small white sofa, a coffee table and an unbleached Steinway piano which Kim stopped playing when she quit her piano lessons. 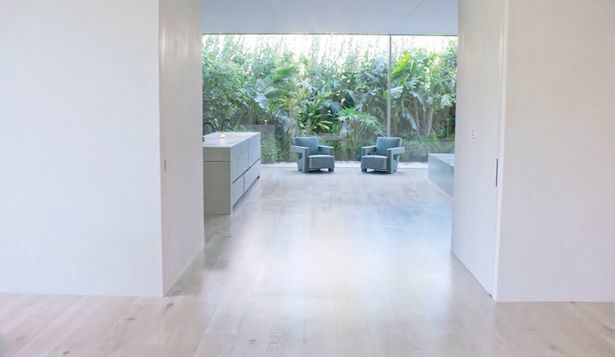 In the interview, she describes the house inspired by Belgian designer Axel Vervoordt as a 'minimal monastery', and reveals she knew Kanye was 'The One' when he took her to Paris Fashion Week. "Kanye has taught me major confidence," she says, revealing that in return she's given him, "Really good financial advice on saving." And she revealed that Vogue editor Anna Wintour actually had a hand in helping them pick North's name. “Actually Anna had some influence in naming North because once she heard that rumour she asked me and said that name was genius so that was helpful to me," she said.